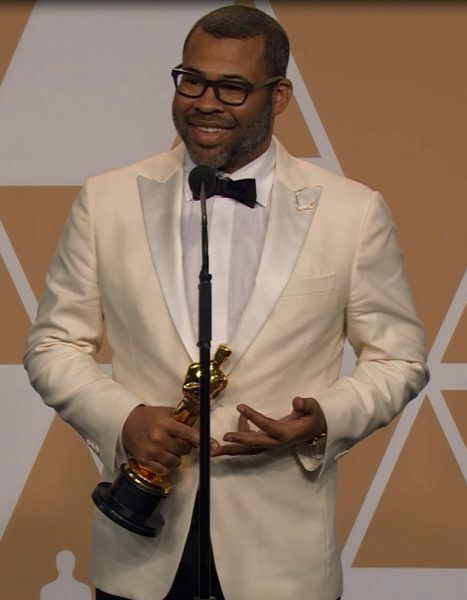 THERE was no Oscar glory for Kumail Nanjiani in the best original screenplay category for his semi-autobiographical ‘The Big Sick’ – but the award did go to another person of colour – Jordan Peele. His highly original movie, ‘Get Out’, which he also directed, features British actor Daniel Kaluuya in the lead role. Kaluuya plays an African-American in a relationship with a white woman and when he visits her parent’s home he has reasons to believe they are not that best pleased. Peele, speaking to the press afterwards (pictured above), said he almost never became a director, simply because there were not enough role models for him to follow. He referred to the current wave of black filmmakers as a ‘renaissance’. Kaluuya, nominated in the actor in a leading role category, lost out to fellow Brit Gary Oldman for his role as Winston Churchill in ‘The Darkest Hour’. The best director Oscar went to the Mexican-born Guillermo del Toro who made an impassioned plea for more stories to emerge from the margins. His ‘Shape of Water’ features a mute woman (British) Sally Hawkins falling in love with a strange and giant creature of the sea. Toro touched on the issue of immigration in his acceptance speech, and said that filmmaking helped to erase difference and suspicion. “I am an immigrant like Alfonso (Cuarón) and Alejandro (González Iñárritu), my compadres. Like Gael (García Bernal), like Salma (Hayek) and like many, many of you. It was one of the themes of the evening along with tolerance, diversity, standing up to discrimination, inequality and sexual harassment. The long and dark shadow of disgraced movie mogul Harvey Weinstein hung over the evening but unlike the Baftas and the Golden Globes, stars did not don black to display their support of #MeToo and #TimesUp campaigns. However, Frances McDormand who won the lead actress award for ‘Three Billboards outside Ebbing, Missouri’ got all the women nominated to stand up during her acceptance speech. She called for producers to listen to women and their stories and promoted an ‘inclusion rider’ – where filmmakers vow to make films which represent the world around them. * Indian stars Shashi Kapoor and Sridevi were recognised in the ‘In Memoriam’ section.